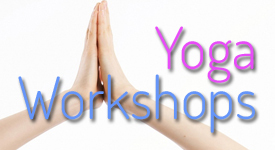 Shrewsbury Yoga - yoga classes in Shropshire, information and discussion. Faith's Monday Yoga takes place in Bomere Heath - beginners and mixed ability classes. Want to advertise YOUR classes on Shrewsbury Yoga? Contact Faith for details of how to get your own page on the site. Lis Wharton has restarted classes in Bayston Hill and Castlefields. Check out Shrewsbury Yoga's featured teachers and classes across Shropshire. Hover over Featured Classes in the top toolbar to see the locations. When you need a whole day on your yoga! Check out longer-form events where you can really immerse yourself in our Workshops/Events section. What's happening in our world today? Is there yoga you can fit into a particular gap in your week? Check out the Calendar.